Michigan is located in the Central Great Lakes Region in the upper Midwest of the United States. It is known as the "mitten state" because of lower Michigan's unique shape, and consists of two seperate peninsulas jutting into the Great Lakes, and has borders with Ohio and Indiana (S), Wisconsin (W), and the Canadian province of Ontario (N,E). The City of Detroit, Michigan's largest city, is located in Southeasern Michigan, and is known as the Motor City due to the three major U.S. automakers being headquartered there. Motto, If You Seek a Pleasant Peninsula, Look about You. Northern Michigan's vast wilderness has rolling hills and valleys, numerous forests, rivers, streams and inland lakes, and some 3,000 mi (4,800 km) of Great Lakes shoreline. The Northern region has a dryer, arid and pleasantly cool summer climate, and has long attracted vacationers from all over the U.S., Canada and even parts of Europe.The Grand Traverse Region has become well-known for agriculture, especially fruit, such as cherries and grapes. Traverse City is known as the "Cherry Capital of the World" and celebrates with a week long festival, the Cherry Festival, each year during the 2nd week in July. In the past couple of decades, the Grand Traverse Region has become well known for its vineyards and the area boasts more than two dozen wineries dotting the Leelanau and Old Mission Peninsulas. Several locally produced white wines have received critical acclaim in international wine tasting competitions, especially the rieslings and pinot grigio varietals, as well as chardonnay. Northwest Lower Michigan also has a vast array of restaurants, from 5-star gourmet fine dining establishments to Brewpubs. In the winter, Michigan's snow-covered hills bring skiers from all over the Midwest. Places of interest in the state include Mackinaw Island, the Mackinaw Bridge, Taquamenon Falls, Pictured Rocks and Sleeping Bear Dunes National lakeshores; and Isle Royal National Park. 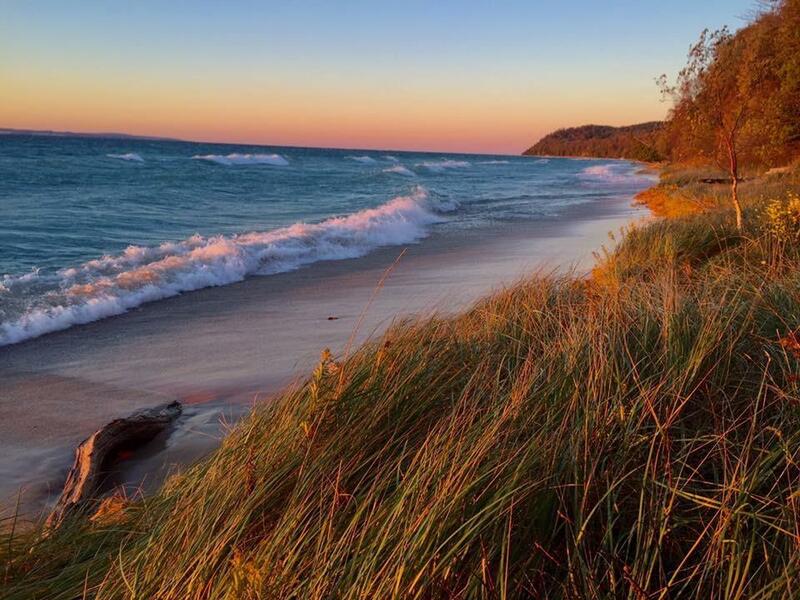 Northwest Lower Michigan is often referred to as the "Gold Coast," due to its sandy beach shoreline and Lake Michigan sunsets. The area stretches from Ludington to the Southwest to Frankfort, Traverse City, Charlevoix, Petoskey and North to the Straights of Mackinaw. Traverse City is the economic, cultural and shopping hub of Northwest Michigan and it also has the region's largest airport, Cherry Capital. The Grand Traverse Region is home to Northwestern Michigan College, Interlochen Center for the Arts, Dennos Museum, the Traverse City Film Festival, and numerous golf courses, ski areas, casinos and wineries. The Grand Traverse Resort & Spa in Acme, MI and Munson Medical Center are two of the area's largest employers.